Allan Boesak, co- author of Radical Reconciliation: Beyond Political Pietism and Christian Quietism, recently brought this image to my attention. I was in attendance at Howard University’s School of Divinity’s 96th Annual Alumni Convocation for which he and Curtiss DeYoung were the guest speakers. Boesak shared with us his insights on race, South African apartheid and divinization and demonization of its leaders. He used this image as an example. Why do we do this? Why do we replace Jesus Christ with political figures and in doing so, subject his humanity to his divinity? Why would we believe that a social deliverance be it from South African apartheid or the American South’s Jim Crow segregation could be found equal in comparison to Christ’s salvific and redemptive work on the cross? Race is simply no excuse to defile the Lord’s table. 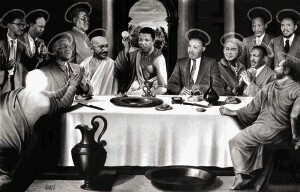 Mandela’s ‘Last Supper.’ New works by the artist., Times Live, October 20, 2010.